Front Row (left to right): Marti Alt (Ohio State Universities Libraries), Ron Deering (Southern Baptist Theological Seminary), Herman Peterson (University of St. Mary of the Lake), Carisse Berryhill (Harding University Graduate School of Religion). 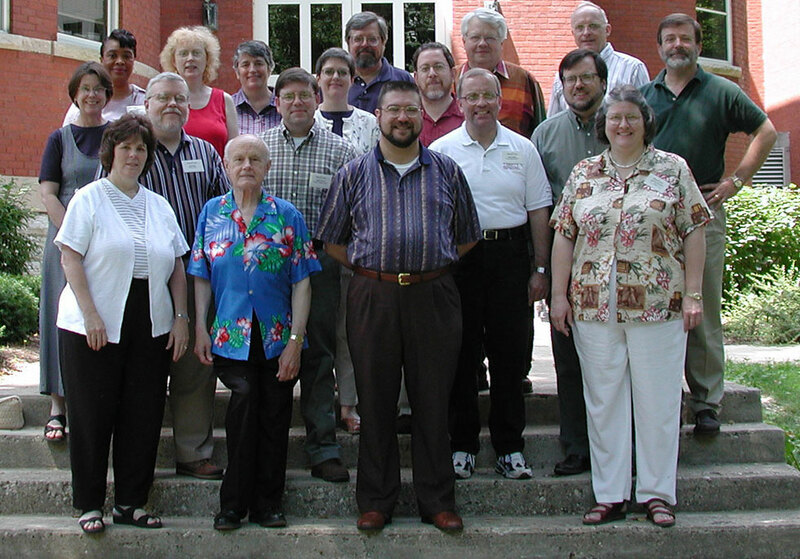 Second Row: Bill Hook (Vanderbilt University Divinity Library), Steven Perry (Pittsburgh Theological Seminary), Keith Wells (Trinity International University), Kirk Moll (Dickinson College). Third Row: Sara Myers (Union Theological Seminary, NY), Christine Wenderoth (Colgate Rochester Divinity School), Roberta Schaafsma (Duke Divinity School), Seth Kasten (Union Theological Seminary, NY), M. Patrick Graham (Emory University). Fourth Row: Carrie Hackney (Howard University School of Divinity), Karen Whittlesey (American Theological Library Association), Joe Coalter (Louisville Presbyterian Theological Seminary), *Dennis Norlin (American Theological Library Association), *Raymond Williams (Wabash Center).